University of Washington researchers are building connections between computers and human brains, and they’re spinning out young companies in the process. 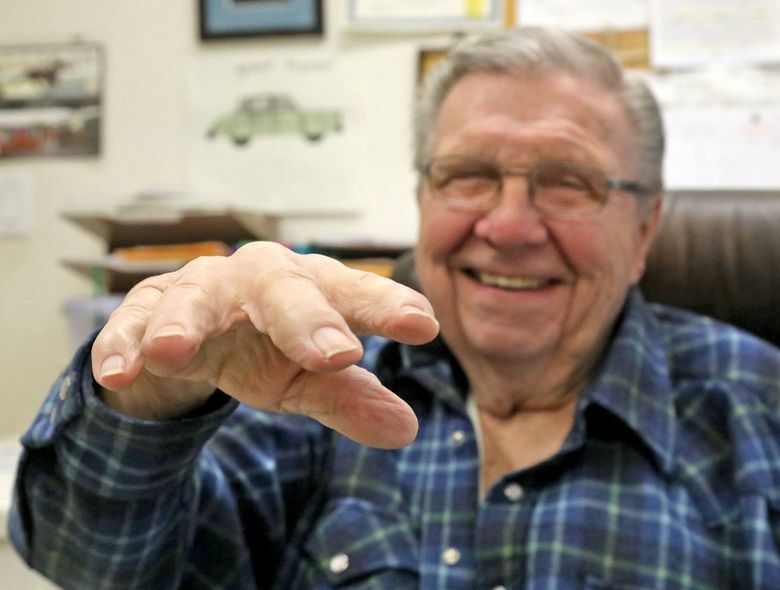 Fred Foy’s hands used to shake and tremble uncontrollably from a nerve disorder known as essential tremor, making it hard for him to do the simplest tasks — from signing his name to eating with utensils. So in November 2016, he went through experimental surgery at the University of Washington Medical Center to fix the tremors with a device implanted in his brain. The fix was pioneered by the University of Washington’s Center for Sensorimotor Neural Engineering (CSNE), which conducts cutting-edge research that aims to create an interface between the brain and computers. The center’s moon shot: To allow people who have been paralyzed by injury or stroke to move their limbs again, said Scott Ransom, director of industry relations and innovation for CSNE. The center was established in 2011 with a 10-year, $40 million federal grant from the National Science Foundation. Two other branches of the program operate at the Massachusetts Institute of Technology and San Diego State University. In all, 50 faculty in the three institutions are part of the program, along with 31 industry partners. Among its faculty members: a neuroethicist who helps scientists work through the ethical implications of putting computer chips in the body and brain to govern movement. 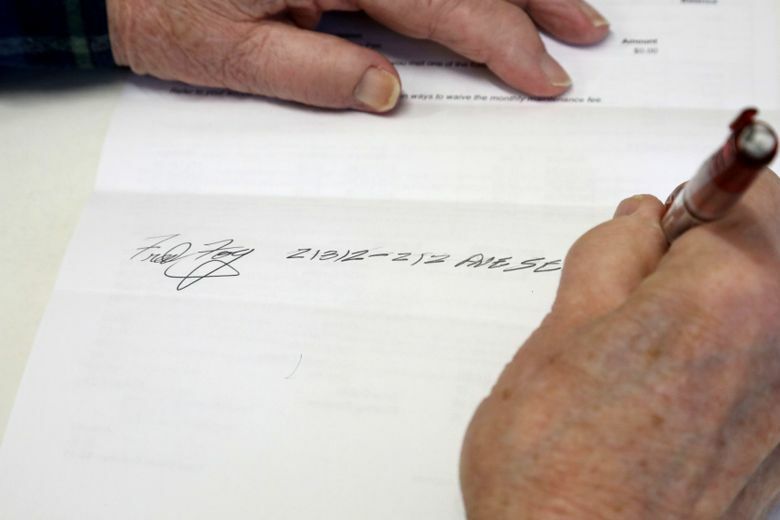 “We’re leading the world in setting these standards,” Ransom said. The center hopes to further its experiments in human research, and the essential-tremor research is one of the early steps in that effort. Essential tremor is a nerve disorder characterized by involuntary, rhythmic shaking, although sufferers do not shake when resting or sleeping. Its cause is not known, and there is no cure. One way to treat it is with deep brain stimulation, using an implanted device that provides electrical stimulation that quiets the symptoms. The center’s experimental device, manufactured by the company Medtronic, is different from other such devices on the market. It helps control the tremors by turning on the stimulation only when a patient moves his or her arms. Research suggests that intermittent stimulation may do a better job of treating symptoms, said UW neurosurgeon Andrew Ko. And because the device isn’t running constantly, its battery is expected to last longer — an important consideration, since changing the battery in an implanted device requires surgery. So far, just four patients have had the experimental device implanted, as part of a clinical trial that runs through the end of 2018. The researchers are looking for ways to expand the trial. The device works this way: Neurosurgeons implant sensors in the brain, where they gather data from the motor cortex — the part of the brain necessary for voluntary movement — and detect when a patient is moving his or her arm. In order to make this work, the CSNE team had to develop machine learning algorithms that “decode” those neural signals coming from the brain and correlate them with essential tremor symptoms. Researchers are also exploring whether patients could consciously adjust the device. A side effect of deep brain stimulation is that it makes it difficult to speak clearly. The researchers hope patients could one day control the device’s on-and-off switch just by thinking about it, rather than turning the device on and off manually. Foy said he went through physical therapy to make sure he was a good candidate for the surgery, and while he was in the sessions, he discovered how many things he could no longer do. The realization brought him to tears. “I didn’t realize how bad a shape I was in,” he said. Now, he goes to the UW every month to participate in research on how the device is working for him. He had the surgery to fix the tremors in his right hand; his left hand still trembles, and he also walks with a cane. “I’m happy to help — anything I can do to advance the science,” he said. Another part of the center’s charter is to spin out new companies that make use of the technology it’s inventing. It is one of the sponsors of a new company, Embotic Technology, which has developed a robotic hand that mimics an actual human hand. The hand was created by Zhe Xu, who graduated from UW’s computer science and engineering program in 2016 and is working on a Ph.D. 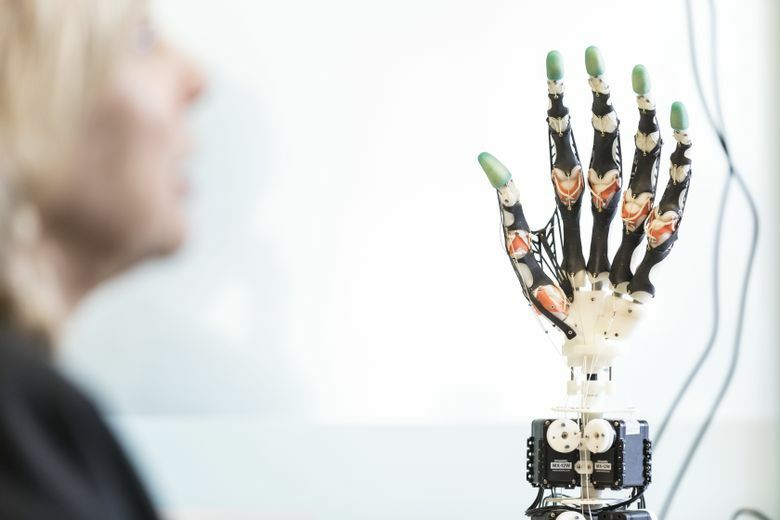 The hand has a wide variety of potential applications, including robotic manipulation research, medical education and space exploration. It could be used in humanoid robotics, adopted as part of an advanced prosthetic, and used in rescue and military applications. It could even be used in animatronics — lifelike robots — in the movie/entertainment industry. It took about seven years for Xu to develop the hand, something that was made possible by both a dramatic explosion in robotic technology and the development of new tools like 3D printers and laser cutters. “They all converged at the same moment,” Ransom said. Xu, who calls his robotic hands “avatars,” said the technology makes it possible to create them for anyone. He’s discovered that it’s much easier for you to learn how to operate a robot hand that’s a print of your own hand. And if the hand is outfitted with sensors, you’re also likely to describethis as feeling like an out-of-body experience. “Suddenly, you feel like you’re controlling yourself remotely,” Xu said.